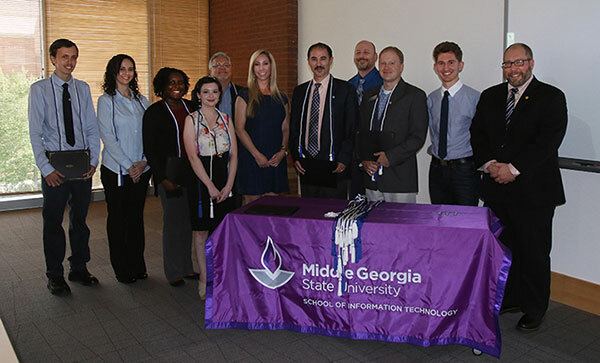 Middle Georgia State University inducted its first members of Alpha Iota Mu honor society chapter on May 5. During the campus celebration, MGA honored 11 students and three faculty members. Alpha Iota Mu (AIM) is the international information technology and information systems honors society. AIM started at Indiana State University in 1996 as the International Academy of Information Management (IAIM). AIM Alpha Iota Mu (AIM) challenges itself and its member chapters to build Character, Integrity, Community and Scholarship in Information Systems majors. Middle Georgia State University became the 10th recognized chapter in April 2017 named Xi. Georgia Southern University is the only other accepted chapter in the state (Delta Chapter, 2000). Inductees are recommended by faculty members after meeting the required 3.85 GPA and demonstrated commitment to the university and AIM’s core values: Integrity, Benevolence, Society, Stewardship, Engagement, Adaptability, and Learning. The spring 2017 ceremony recognized Dr. Alex Koohang, dean of the School of Information Technology (IT) for excellence in scholarship; Dr. Kevin Floyd, chair of the School of IT for excellence in leadership; Dr. Neil Rigole, faculty member in the School of IT for excellence in service to his community and the University; two past graduates who demonstrates core values and excellence, Skylar Hart and Heather Harper; and the Class of 2017 inductees: Mark Ashurst, Jamie Hawes, Patricia Horton, James Kazmierski, Alexandra Papadopoulos, Charles Speir, James Thomason, Daniel Harper and graduate student Vaquasha Rhodes. Photo: L-R are Mark Ashurst, Heather Harper, Vaquasha Rhodes, Alexandra Papadopoulos, Dr. Neil Rigole, Kelly Jones (AIM president), Dr. Alex Koohang (dean of the School of Information Technology), Doug Smalley (AIM vice president), Dr. Kevin Floyd, (School of IT chair), Michael Koohang (AIM treasurer), and Dr. Scott C. Spangler (faculty adviser).